For the greatest birthday parties in Minneapolis, come check out Action Packed Premier Paintball games. The paintball matches held here will make any birthday especially memorable and we even offer special promotions for birthday groups. Action Packed Paintball has many outdoor scenarios, from jungles to the Wild West. Some, like speedball, are a challenge of agility and speed. Others are held in wooded areas with lots of places to hide, where stealth and cunning matter most. Outdoor games can be held when the temperatures drop as low as 27 degrees and both the Minneapolis and Maple Plain sites have indoor paintball sites. 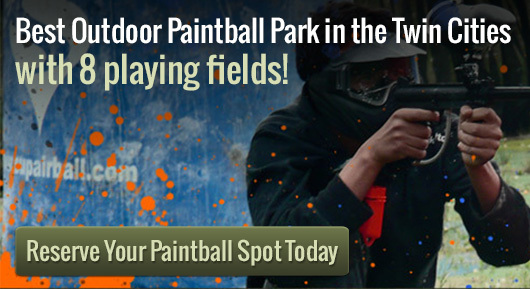 By taking your Minneapolis birthday party here, you can live out your paintball dream no matter how it looks. Action Packed Paintball birthday parties in Minneapolis are easy. Even if some people would rather watch than play, most of the fields are very spectator friendly so people can sit back and watch their friends fight in the paintball game without them. This is a very fun way to celebrate a birthday because it goes beyond the generic party formula and will let the entire group burn off some energy and have some mock battles before settling down for cake and ice cream. There are special packages available for birthday parties and advance registration is required. For the best birthday parties in Minneapolis, Action Packed Paintball is the perfect place to go. There are many scenarios and set-ups for outdoor paintball games, so people can rely on stealth or speed depending on the birthday celebrant’s preference. For winter fun, there is even an indoor paintball arena located in Minneapolis for year-round adventure. Remember to call us at 952-492-6776 in case you have any questions or if you would like to book a time. Please get in touch with us as soon as possible, as advanced reservations are required.